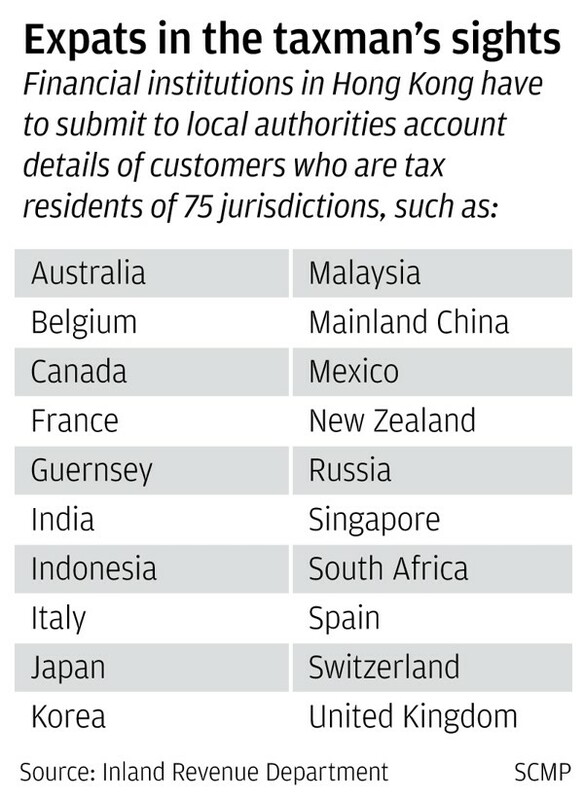 More than 1,700 financial institutions in Hong Kong have submitted to local authorities the account details of customers who are tax residents of 75 jurisdictions around the world, as the city prepares to exchange information with other governments to crack down on tax evasion. But as Hong Kong has agreements with only 50 of these jurisdictions, including mainland China, Canada, Singapore and Japan, it will only send information annually to local tax authorities in those areas. The first exchange is set to take place by the end of this month, and the remaining 25 jurisdictions will receive information once they activate “exchange relationships” with Hong Kong. The Inland Revenue Department revealed to the Post that it had earlier asked 1,800 entities, including banks, insurers and wealth management companies, to hand over information of customers who are non-tax residents. “Up to September 6, 2018, the submission rate is around 96 per cent,” a department spokesman said. It received reports detailing account balances, income from insurance products, dividends paid, sales proceeds from financial assets and other income generated from assets. Hong Kong is among 149 jurisdictions that are party to a global tax cooperation initiative known as Automatic Exchange of Financial Account Information in Tax Matters (AEOI). The city’s well-developed financial markets have long attracted investors, especially the mainland’s wealthy elite. Two-thirds of total assets under management in Hong Kong, or HK$15.92 billion (US$2 billion) last year, came from non-Hong Kong investors, according to a survey by the Securities and Futures Commission. It did not specify how many of them were mainland Chinese. The Insurance Authority’s data showed clients from across the border pushed up the amount of new premiums collected annually from HK$5.2 billion in 2007 to HK$72.7 billion (US$9 billion) in 2016. Mabel Chan, former chairwoman of the Hong Kong Institute of Certified Public Accountants, said financial account holders in the city who were tax residents elsewhere should consider getting advice from professional consultants on their liabilities. “This [would be especially important] for those from jurisdictions implementing worldwide tax, such as China,” Chan said, referring to how mainland tax authorities require taxpayers to report overseas income. Peter Stein, managing director of the Private Wealth Management Association, said Hong Kong’s commitment to the initiative would not weaken its status as an asset management hub. Customers have had “quite some time to digest” details of the AEOI with financial institutions collecting the information in recent months, he said. “And what you can invest with an account in Hong Kong is far more than what you can do on the mainland,” Stein added. Praveen Daswani, deputy chairman of the Hong Kong Federation of Insurers, welcomed the implementation of AEOI. “[It] not only enhances Hong Kong’s status in the international arena, it also reinforces Hong Kong as being a robust and credible jurisdiction for investment,” he said.